Today is a busy day for no-no birthdays, with Bill Stoneman turning 74, Tom Phoebus turning 76 and Ed Lafitte (1866) born on this day. Stoneman threw two no-hitters for the Montreal Expos. His first came in the club’s ninth game, as Stoneman no-hit the Philadelphia Phillies on Thursday, April 17, 1969 at Connie Mack Stadium. His second came during the first game of a Parc Jarry doubleheader on Monday, October 2, 1972, as the Expos topped the New York Mets 7-0. 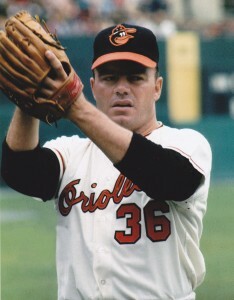 Phoebus a Baltimore native who turns 76 today, tossed a no-no for his hometown Orioles on Saturday, April 27, 1968 at Memorial Stadium. The O’s topped the Boston Red Sox in that game 6-0. Lafitte began his career with the Detroit Tigers. He moved over to the competing Federal League in 1914 and was pitching for the Brooklyn Tip-Tops when he threw his no-hitter against the Kansas City Packers during the first game of a doubleheader on Saturday, September 19, 1914 at Brooklyn’s Washington Park.